Updates to Theodore's profile since your last visit are highlighted in yellow. 5 - lots of sports involvement, volleyball, softball, baseball, basketball, football, dance, downhill More…skiing, cross country skiing (Olympian), College Degrees and works in progress...very fun to watch em all...good kids. Youngest now 22, oldest 32. I rememeber Principal Hasley (I think that's how it's spelled) playing 'Schools Out' by Alice Cooper over the PA on our last day...or am I dreaming? Theodore Williams added a comment on his Profile. Theodore Williams updated his profile. View. Theodore Williams changed his "Now" picture. Theodore Williams changed his profile picture. 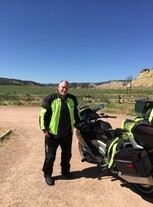 Theodore Williams added a photo to his profile gallery.